What is the future of impact work? On February 5th 2019, Amani Institute’s global conference titled The Future of Impact Work will bring together international experts from various sectors and guests from more than 20 countries in São Paulo, Brazil, to discuss trends and opportunities in social impact work. From the World Economic Forum to Silicon Valley, everyone is talking about the future of work and how to react to it. 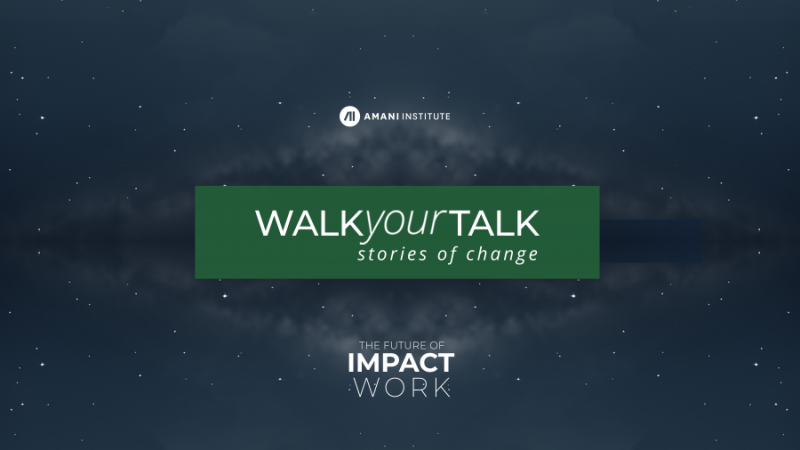 Amani Institute is exploring how our rapidly changing world is affecting the future of impact work – or rather, what capacities are needed from institutions, companies, organizations and from professionals across sectors to take agency and proactively shape our future. Rapid developments in technology, demographics, migration, climate change and economies don’t only affect the way we live and work but also how we can create positive change across sectors. Beyond simply predicting and responding to these changes, Amani Institute is bringing together analysts, professionals from the private and the social sectors, CEOs and founders of organizations creating social impact from all over the world for a unique opportunity to learn from each other, exchange experiences, network. and develop new. Leading changemakers in the world of social innovation, such as Lisiane Lemos, founder of BAM (Blacks at Microsoft) who was recognized by Forbes as one of the Brazilians under 30 who made a difference in 2017, Claudia Valladares, Co-Founder and Director of Impact Hub Caracas, Sallyann Della Casa, founder of GLEAC promoting a breakthrough technology to develop and measure key soft skills for the future and Miguel da Hora, Amani Fellow and Global Shaper, (the youth network of the World Economic Forum), will share their insights. Participants will explore different perspectives throughout the day in formats that range from a sound Responding to the recognized shortage of leaders in the social impact sector, and through a new immersion to building inclusive tech in Amaphiko’s Makerspace to discussing the future of social finance and more. The conference will also coincide with Amani Institute‘s five-year anniversary in Brazil, acknowledging Amani’s commitment to promoting social innovation in São Paulo reinforcing the role of Brazil and Latin America at the frontier of social impact work. Responding to the widely recognized shortage of leaders in the social sector, Amani Institute‘s mission is to develop professionals who create social impact through new models of education and training that help professionals develop the practical skills, networks, and experiences for long-term career success. Our core methodology comes to life in our award-winning Certificate in Social Innovation Management, which runs concurrently in Kenya, Brazil, and India. This program has enrolled 375 Fellows from more than 50 countries and has been featured in Fast Company, Forbes, the Stanford Social Innovation Review, CNBC Africa, and Vanity Fair, among others. Amani Institute also specializes in developing customized training programs for foundations, universities, NGOs, and companies all around the world. Our 60+ clients to-date have included UNICEF, Ashoka, Vodafone, Deloitte, Georgetown University, University of Chicago, the US government’s Young African Leaders Initiative, CARE, and Oxfam. Amani Institute was founded in 2011 by Roshan Paul and Ilaina Rabbat, from India and Argentina respectively, who have a combined 30+ years experience in working in social entrepreneurship globally. Speakers are available for interviews.